Question - a friend of mine who brought her four younger kids to see this movie had a bit of an issue with the fact that the term "cussin" is used so often in the story. I gave my thoughts on it during my podcast, but what say you to such a detail? BTW - Totally agree, definitely one of Anderson's better flicks, while not quite his very best. I did question if all the 'cussin' was proper for children. I didn't come up with an answer, but I think when it comes to kids there shouldn't be any doubt. Right? I don't see why saying the word "cuss" is so terrible. I mean, the average parent uses the actual swear words around a kid; is being clever such a threat? I'd probably rank this right under Tenenbaums as my favorite of his. That's the only one that completely won me over but this one came close. 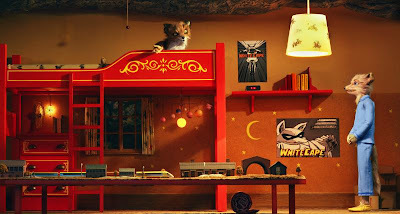 Most surprising to me about Fantastic Mr. Fox were Anderson's references to classic film moments. There's a Welles reference (Michael Gambon's father does a Charles Foster Kane-style wrecking of his toolshed); a Nicholas Ray reference (the shrew quotes Dean's Jim Stark by complaining that Fox's arguments with his wife go nowhere); a Pakula reference (the secret messages are pulled from All the President's Men); and, best of all, a Truffaut reference: the Day for Night theme by Cole Porter plays during the waterfall scene. Lovely film all around, too.